This nymph, based on Gary Borger's Strip Nymph, is one of Jim Carravallah's favorites when fishing murky lakes. Probably would work very well fishing bass in river pockets, too. The fourth featured fly of our fourth fly swap, which was sponsored by Tim at Yagers Flys is from Jim Carravallah. 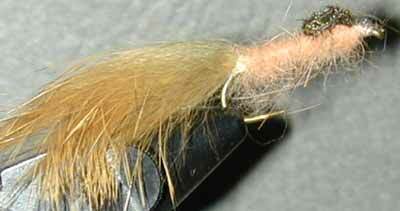 "This fly can be tied in many colors and can be used as large swimming nymphs or small baitfish. I've tied it using tan, black, silver, olive and white tail and dubbing fur combinations to represent various types of life in both lakes and on streams. I like it because of the waving fur and undulating tail add motion even on slow retrieves." Hook: 2X Heavy 1X Long Turned Down Eye (TMC 3761). 1. Weight front 2/3rds of hook. 2. Wrap hook with thread to tail tie in point. 4. Dub fur from tail to approximately 1/3 of distance back from eye. 5. Tie in clump of pheasant hurl facing toward hook, allowing hurl to spread flat around upper half of hook shaft. Taper thread toward head. 6. Dub fur from just on top of hurl tie in point toward head, allowing thorax to be slightly larger than abdomen. 7. Pull hurl over and forward toward eye, tying in clump at eye to form covert. Cut herl at eye. 8. Wrap thread back to form head over top of covert tie in at eye, covering cut ends. 10. Add drop of head cement to top of thread and forward part of covert. 11. Pick out fur along top to help hide tail tie in point, and along sides and bottom to create "buggy" look.